Mahenge Spinel In 2007 some very special spinel was discovered in the Mahenge plateau of Tanzania. These gems displayed an intense pink-red color and a unique neon-like glow. Gem dealers were unanimous in calling this the finest spinel they had ever seen. These spinels have been incredibly popular with collectors and have proven to be excellent investment gems. It is now very difficult to find these in the market, but this year we found some top pieces in the 2 to 4 carat size to add to our collection. These make stunning jewelry, as you can see in the video above. Tsavorite Garnet is another special gem from East Africa, and rivals emerald as the finest of all green gemstones. Compared to emerald, tsavorite is a more brilliant and fiery gem, with color saturation that can be matched by only the finest emeralds. Unlike emerald, tsavorite is always completely natural and untreated. Because of its many surface-reaching inclusions, emerald is almost always fracture-filled with oil or resins. Tsavorite is rare over 2 carats, but this year we acquired some beautiful pieces in the 2 to 4 carat size. Blue Tourmaline Blue is the rarest color in tourmaline, and recently some extraordinary blue tourmaline has been discovered in Namibia in southern Africa. They include some pure blues, some teal blues and some vivid bicolor blue-green gems that display blue on the table and green on the ends. We were so impressed by these beautiful gems, we bought as much of these rare material as we could find, knowing that we might never see it again. Rubellite Tourmaline Red is one of the rarest colors in the gems world, and a pure red, such as the famed pigeon's blood ruby, is exceptionally rare. Pure red gems in large sizes are even rarer. This year we acquired some exceptional Rubellite Touramalines from Nigeria in a pure red. These are unusual for Rubellite, which is typically a pinkish or purplish red. We have a number of fine pieces over 5 carats, including several exceptional stones over 20 carats. Opal from Ethiopia We are currently in the midst of a tremendous boom in fine opal since a major discovery in Ethiopia about 10 years ago. We've been buying the best of this material, which is highly translucent with a vivid play of color, displaying a full range of colors against a white or blue or brown body color. Large patches of red and orange and green are common, and play of color is sometimes distributed along parallel colums that resemble fingers. If you've ever considered adding a fine opal to your collection, there has never been a better time to acquire one of these beautiful gems at a great price. This month we feature fine Beryls from our collection, including Morganite, Aquamarine, Mint Beryl and Emerald. Click on any photo to view the details for the gem. A fine neon pink-red Spinel from Mahenge, Tanzania. Very rare over 3 carats, this gorgeous 3.58 ct oval displays the neon glow which is characteristic of these rare Spinels. This is beautiful material with a large face for the carat weight. Certified by GemResearch Swisslab (GRS) as natural untreated Spinel from Tanzania, with the color graded as "pinkish-red." A treasure for the rare gem collector. A top Tsavorite Garnet cushion from Kenya with amazing brilliance! This rare Tsavorite has an intense vivid green hue that is bright and open. This is beautiful crystal, very clean and precision cut. This fine gemstone will set up beautifully in your jewelry design and will be an important addition to any collection. Guaranteed natural and untreated. A very fine Red Rubellite Tourmaline in a perfect size for an impressive ring! Pure red is one of the rarest colors in the gem world, and very hard to find in Rubellite. This gorgeous gem has outstanding open color and full fire, with exceptionally good clarity for this variety. Guaranteed natural and untreated. A gorgeous pure Blue Tourmaline from the recent find in Namibia. Amazingly vivid color with perfect clarity, this rare Tourmaline will set up beautifully in your jewelry design. Guaranteed natural and untreated by AJS Gems, Bangkok. An outstanding gem Opal from the famous deposit in Welo province in northern Ethiopia. This fine Opal displays a vivid blue body color with superb play of color and excellent translucency. An amazing stone at a modest price, these fine Opals are one of the best values in colored stones today. Guaranteed natural and untreated. A stunning Mahenge Spinel ring in 18k white gold with diamonds. The Spinel is a top color, very clean and beautifully cut. It has been certified by GemResearch Swisslab as natural Spinel with color graded as "vibrant" pinkish-red. The elegant split-shank ring features 44 white diamonds with a total carat weight of 0.30 carats. This unique ring will make a wonderful gift for someone special. Miners at the Kagem mine in Zambia have discovered a 5,655-carat gemstone that has been named Inkalamu, "lion" in the Bemba language. Discovered in October, the enormous rough emerald is described as having "remarkable clarity and a perfectly balanced golden green hue." The Kagem mine is 75% owned by London-based Gemfields, and 25% owned by the Zambian government. The Inkalamu Emerald will be offered for sale in November at Gemfields' auction in Singapore. 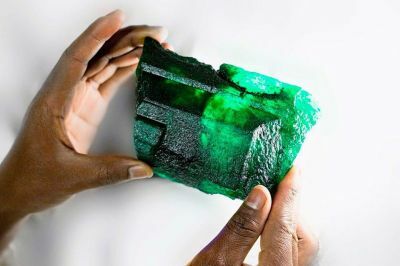 The huge stone is expected to yield a number of large, fine-quality cut emeralds, but it is possible that the eventual buyer will keep it in its original form as an investment. 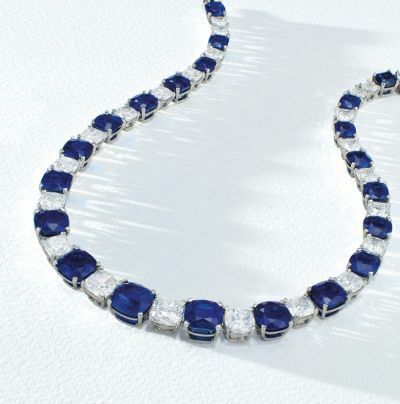 A fabulous Kashmir Sapphire and diamond necklace was the top seller at Christie's Magnificient Jewels auction in Hong Kong in November, drawing a price of $15 million. Known as the Peacock Necklace for the peacock-feather patterns on the platinum mounting, the necklace, features 21 high quality Kashmir Sapphires with a total weight of 109.08 carats. The largest Sapphire in the suite weighs 10.56 carats. Kashmir sapphires are renowned for their brilliance and intense saturation of velvet blue. These extraordinary gems were first discovered in 1881, when a landslide in the Zanskar range of the northwestern Himalayas first revealed sapphire-bearing rocks. By 1887, Kashmir’s first sapphire mine had been exhausted and production ceased. As a result, gem-quality Kashmir sapphires are now extremely rare. Morganite is a durable gem, with a hardness rating of 7.5 to 8.0 on the Mohs scale. High quality specimens tend to be very clean and free of internal cracks. Though not as hard as ruby or sapphire, a fine morganite in a secure setting will last for many years. Morganites are available in a wide range of shapes and cuts, and are quite affordable, even in larger sizes. The delicate color, whether pure pink or pink-orange, flatters any skin tone, and pink has long been associated with love, romance, femininity and tenderness. You will usually see Morganite set in white gold or rose gold, often in an elegant combination with small diamonds.